Islam and the Koran cannot be understood properly without understanding its doctrine of abrogation (naskh) laid out in 2:106, 16:101 etc. This is the idea that Koran verses 'revealed' to Muhammad later in his life supersede any contradictory verses 'revealed' earlier in his life. However the Koran is not in chronological order. The verses in this book are of course the same (Pickthal translation) but the chapters are actually written in chronological order as agreed by Islamic scholars, but back to front so that the verses that aren't superseded come first. This makes the Koran far easier for the reader to understand. 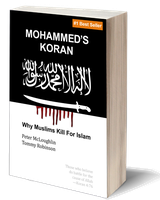 If you want to understand why Muslims commit the vast majority of terrorism worldwide in the name of Allah you need to go to the Koran and this one is the best for doing so.